And a long sleeved one complete with a hood for snowy days. 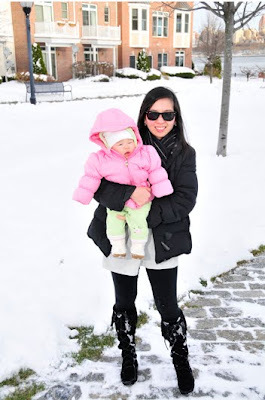 She also has a onesie puffer suit when it's Arctic freezing from Tito Al, Tita Peachy, Malaya and Nina. She looks like a Michelin baby when she wears them. So cute! And so warm she falls asleep in it every time! I know I have a picture of her wearing that somewhere! Let me look!